Permanent System for Power Quality, Energy and Demand, and Process Monitoring True to its three decade legacy as the industry leader in power quality analysis, Dranetz proudly offers Encore Series™ permanent monitoring system for power quality, energy and demand, and process monitoring. Encore® Series 61000 family of DataNodes has a configurable design that allows users to specify the right instrument configuration for their specific application. All this flexibility in one instrument, combined with the multi-user web interface of Encore® Series Software and available local 1/4 VGA color touch screen display, truly make Encore® Series the right product for your application. Available with or without a color display, the 61SG/61SGD panel mount design is ideal for switchgear applications. The 61000 DataNode enables you to combine modules in software to build your own instrument with up to four virtual analyzers. 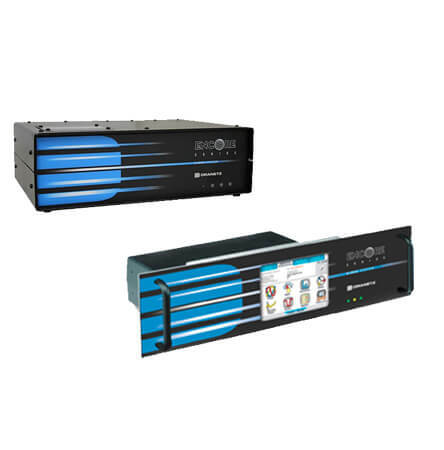 Virtual analyzers are either individual modules working as independent analyzers or combinations of modules such as when combining Voltage & Current modules to create a power quality, demand & energy analyzer. Encore Series is perfect for ongoing monitoring to determine compliance with worldwide standards such as EN50160 and your own specialized compliance requirements. Encore Series voltage modules are certified by an independent laboratory for Class A compliance with IEC61000-4-30. You can be confident that Encore Series measurements are accurate and repeatable and that they meet the most stringent requirements. Available in both standard and switchgear mount enclosures, the 61000 family of DataNode’s can be used in a wide variety of applications. Choose the appropriate mainframe, then add the modules that meet your application. The switchgear version is available with a 1/4 VGA color touch display (61SGD) or without display (61SG). The standard enclosure (61STD) is a stand alone instrument available with a rack mount (with or without 1/4 VGA touch display), wall mounting brackets and weather resistant enclosures to meet the most severe operating environments. Sampling 512 samples/cycle, 16 bit A/D. Accuracy: 0.1% reading +/- 0.05% full scale, 3KHz bandwidth for low/ medium freq. transients. Does not include CT.
© 2019 All rights reserved.Atandra Energy Private Limited. KRYKARD is a registered trademark owned by Atandra Energy Pvt. Ltd.